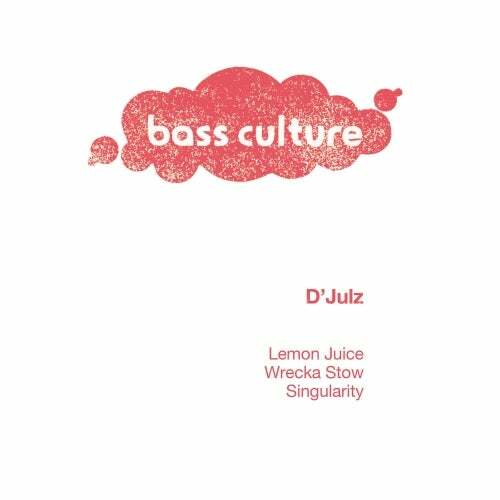 D'Julz As we move into 2019, the captain of the good ship Bass Culture steers the label to its latest release with D'Julz delivering a hot new three­track EP. The seasoned Parisian maestro channels his years of experience into this new release, with a polished collection of tracks, all centred on the dance floor with subtle, yet persuasive production across all three cuts. As you may expect from D'Julz and Bass Culture, there is plenty of depth, energy and low end to keep those hips swinging and heads nodding... Things get off to a bouncy start with Lemon Juice, a funky little number with lively drum programming and a very spirited bassline. Quite minimal in its production, this cut uses its relative simplicity to grab you and keep you hypnotised until the very end. Wrecka Stow taking us on a dark side ride. D'Julz kicks off in style with this driving techy cut. A simmering energy pervades throughout as he gently builds the tension, working from a spellbinding riff that repeats over and over. Occasional dips and rises in the energy create electrifying moments, as this rolls out with a deadly rhythm. Lastly, theres Singularity, a sombre dance into the wilderness. This dreamy, mellow cut is pushed along by softened breaks and a subdued bassline. D'Julz tantalises our emotions with wistful atmospherics that send chills down your spine as you venture ever deeper into the misty realms of the eerie world he has created. A fitting end to the EP....There we have it, D'Julz returns to his beloved label with a formidable new collection of tracks.